To the Editor and Fellow Readers: When Peggy and Paul were babies their daily schedules moved with clocklike precision. They were bathed at such a time; they were fed at designated intervals. They napped and played according to a certain previously mapped out plan. And I, the conscientious mother, gave up all outside interests, my world revolving around my two babies. But babies grow up, and when both my children were in school all day I began to take up outside interests and to taste life for my own personal enjoyment. So the years passed until the fall of 1931. At that time Peggy was in her eleventh year. Gradually, it dawned on me that my daughter, who had always possessed a sweet, lovable disposition, had become subject to unbridled fits of temper. Her mood might be sparkling animation one moment, darkly morose the next. Her appetite was erratic, and her attention to things said to her very poor. That Peggy was approaching the threshold of womanhood was, of course, the root of the marked change that had come over her. But the other conditionsâ€”faulty elimination, poor posture, fatigue and its allied evilsâ€”were serious ones which might lead her into a nervous, high-strung girlhood, resulting in that all too common neurasthenic middle age, a curse to the sufferer, a torture to his or her associates. It was then that I worriedly fingered a magazine on our reading table, which had gone unread because the round of bridge games had proved, for me, too fascinating. Idly now, I turned the pages as I pondered my problem. Each page held up before my troubled eyes glorious successes of men and women, young and old, who had found health and happiness through “good living.” Suddenly, I knew what I was going to attempt. 7:40 Rise. Drink glass of water. 8:00- 8:15 Bathe, brush teeth, comb hair, dress. 8:15- 8:40 Leisurely breakfast, preceded by a glass of water. 8:40- 9:00 Go to school. 12:00-12:20 Home from school. Drink a glass of water. 12:25-12:50 Take a rest period, lying completely relaxed on bed. Follow by another glass of water. Any extra time before school, out-of-doors with friends. 4:00 Home. Drink a glass of water. Lunch. 4:00- 5:30 Play activities out-of-doors. 5:30- 6:00 School homework. Help given by Motherâ€”except in arithmetic, where Dad is the shining star of the family! 7:00- 7:15 Undress, wash, brush teeth. Drink glass of water. On Friday and Saturday nights an extra hour was allowed on the schedule as there was no school to be attended the following days. On these days, too, as much time was spent in the open air and sunshine as possible. (1) Lie on back, arms at sides. Raise arms slowly, inhaling the while, until backs of hands are lying flat on floor above your head. Hold breath, counting four, then exhale slowly, bringing arms back into original position at sides. Repeat five times. (2) The nutcracker exercise. Lie on back, arms at sides. Bend left leg up toward chin. Imagine you are cracking a nut between thigh bones and spine. Crack hard; it’s a tough nut. Repeat separately, then both legs together. Repeat several times. (3) Lie on back. Rise to a sitting position without aiding yourself with hands or arms. Depend solely on back and abdominal muscles for the upward pull. Repeat five times. (4) Place two straight chairs back to back. This may be done, instead, by placing a chair out a few inches from the wall of the room. The space between the two chair backs, or wall and chair, must be just enough to allow you to squeeze through. Squeeze back and forth between the chairs, or wall and chair, at least ten times. Make believe “It’s poison” if you touch with your body either chair, front or back. You can readily see that after the first lung-stretching exercise the exercises 2, 3 and 4 are designed to strengthen back and abdominal muscles and straighten spine. Occasionally we varied with other exercises, but these were our standbys. Breakfast: Fruit, either stewed or fresh. Cereal. Glass of milk. Wholewheat toast or muffins, sometimes with honey. School Lunch: Glass of milk and graham crackers. Noon Lunch at Home: Eggs in variety, simple cheese dishes, cream soups, salads, plenty of green leaf vegetables, whole-wheat bread, bran muffins. Simple desserts like junket, gelatin, custards, apple sauce, home-baked cookies, or fruit. After-School Lunch: Whole-wheat sandwiches. Cookies. Glass of milk. Dinner at Night: Moderate portion of baked or broiled meat or fish. Potato or rice. At least one other vegetable, often two. Special attention is placed upon all kinds of greens, lettuce, cabbage, and the good old carrot. Creamed vegetables are a frequent feature in order to consume more milk. Our family never eats dessert after the biggest meal of the day, unless it is to take a little fresh fruit. Three weeks after entering upon her new regimen her eliminations were normal. A few weeks later examination of a specimen showed no trace of albumen in the urine. But her temperature remained subnormal, also her blood pressure, indicating that her system was still fatigued. Sometime in February Peggy came home with sparkling eyes, announcing she had made the greatest gain in weight of anyone in the nutrition class over a two-week period. For this she received a gold star on her record card. Her school work showed improvement, too, at this time. I wrote a letter to the principal of Peggy’s school, who had been particularly interested in her case, telling her what schedule I was following, and what results we had had so far. The principal talked with me afterward, and reported that the letter had been read to teachers at a meeting in order that they might see what often took place in a young girl at about this age of eleven or twelve, and that they might understand how the various complications might be eliminated. The crowning achievement in Peggy’s health life came, I think, the day she danced in from school to exhibit what is, to her, a most precious possession. It’s only a celluloid button, but there is pictured on it a seven-point star. Seven points for satisfactory condition of teeth, eyes, ears, nose, throat, weight and posture. Besides having made the grade in weight and posture, Peggy’s eliminating system functions excellently, her pulse is normal, her temperature what it should be. The light in her eyes shows that fatigue has been put to rout. I, too, think Peggy’s seven-point star a most precious possession, but I think I hold still dearer the star of an understanding love that shines brightly for us both since we have found happiness through health. 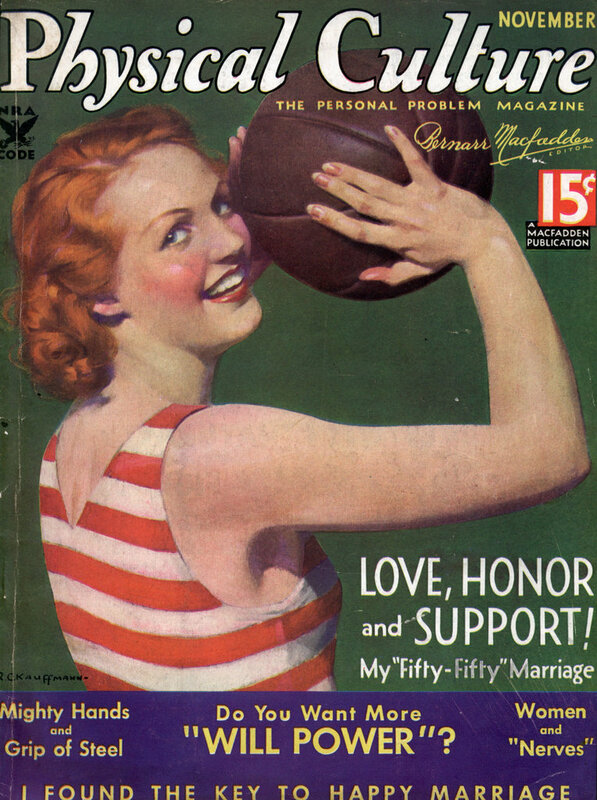 Ah, for a time when there were actually half-naked girls in Physical Culture magazine. She goes to bed at 7:30 PM? She has 3 lunches a day? Glad her eliminations returned to normal. I didn’t realize there was a time period where the school day was broken-up with a couple of hours back at home for a nap.